Branding is an important part of any small business. It encompasses the visuals, such as logo and colour scheme. As well as the personality of the brand – how things are communicated, what the business is about, values and mission, raison d’etre. Your branding is what sticks with people. It’s what will resonate (or not). It’s how you will be remembered. It gives off an impression of your business. It helps people decide if you’re right for them. Phew! Branding is pretty darn important then wouldn’t you say? And for this reason, branding is something that really, really stresses people out. They feel that they have to get it perfect. If they screw it up, they will lose out on business, revenue, opportunities and basically just doom their biz to failure. That’s quite a weight to carry on your shoulders. It’s not unusual to feel like you have to pick a brand and stick with it. Maybe you paid good money to have a designer come up with an awesome logo. Or got a website created and content written. 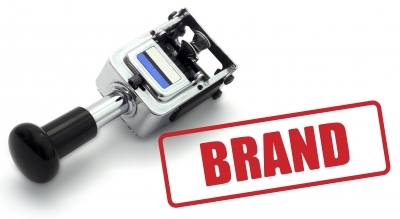 In short, you invested in this brand, and abandoning or shifting it can be scary. You don’t want to feel like you wasted all that money and time! Not to mention the fact that customers know and recognize your brand. Or perhaps the fear rests around alienating potential clients. You might feel that you should shift your brand and your focus in a particular direction, but you’re scared of stepping on toes or that some people might not like you any more. Your goat brain is begging you to please, please, play it safe. Changing things up can be really overwhelming. You might have a million different ideas. You might not be sure of what the “right” thing to do is. I know that’s how I felt! Even when writing this post I started second guessing some decisions. But it can also be really fun, if you give yourself the space to be creative and enjoy the process. If you take the heaviness out of branding. When you’re first starting out a business, do you absolutely know with perfect clarity what it is that you are doing and how you will serve your target market now, next year and 10 years down the road? Most likely not. A business always evolves, and so can a brand. When I first started my small business, I had a vague, general idea of what I was doing. I was going to help companies with internet marketing. Not so specific. But I decided that I would use myself as the centre of my business and my wonderful design team (ECD Graphics, love you guys) created a personal brand for me that I loved. As I plugged away, I realized that my true passion lay with working with small businesses. So I wanted to incorporate this new angle in, but I wasn’t totally sure how I would do it. Rather than commit to it full steam ahead and force myself to pick exactly what I was going to do, I chose to let things flow for a little bit. I decided that my blog would be where this new small business focus would reside. But instead of getting my designers involved, I opted to do it myself for a while. Why? I wasn’t yet sure exactly how this was going to all play out. I wasn’t ready to commit to anything or give clear direction. Was I going to keep my personal brand and the small business brand separate entities with different websites? Was I going to keep them together? I didn’t know. I wanted to give myself the space to try new things without feeling like I’d made a major investment anywhere – that felt restrictive to me. I also wanted to learn how to do things myself. Yes, my awesome web team absolutely would have handled everything for me. But I wanted to learn how to do things myself. How to set up and install a theme (I use Thesis). How to customize it. Etc… I wanted to play around with things. So that I could truly say that I know and understand how to take a DIY approach to a WordPress based website. So I decided to keep my blog separate and outside of my main website. Not ideal by any means – I know it was a bit confusing too. I had a client ask me if she should keep her blog outside of her main site like I did, which I said no, absolutely not, your blog should live in your website – that’s the ideal set-up. But I feel like I needed to go through that whole process and give myself space to think. My personal brand is me as a consultant serving small business owners that need someone to help them with their marketing. Some of them just plain aren’t interested in learning about certain aspects of web promotion and they will never sign up for my newsletter or read my posts. Small Business Bliss serves small business owners that want to educate themselves and take a do-it-yourself approach. And then there are those that overlap between the two and fall in both camps. How to approach this with branding is what left me a bit confused. Sure, I still consider abandoning my personal brand and going Small Business Bliss all the way. I may still do that one day. But for now, this is what works for me. So, in my opinion, branding is never a done deal. It’s perfectly OK to give yourself the room to evolve and grow. Changing directions can be a beautiful thing. It can bring you closer to your ideal business where your talents and the ‘why you’re here’ can shine. You should never let the fact that you got a logo done and bought a URL stand in the way of that. 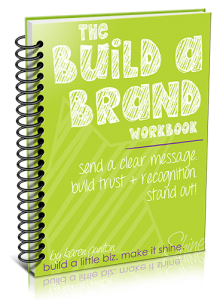 Are you struggling with branding your small business? Not really sure how to go about it? 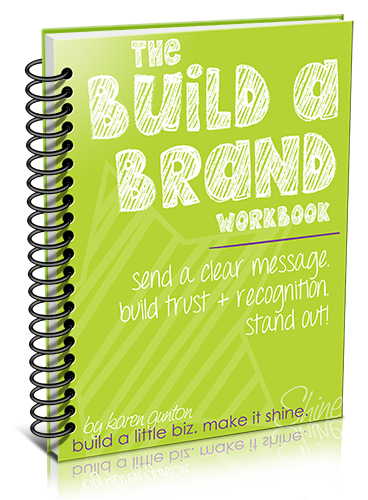 I highly recommend the Build a Brand workbook from my friend Karen Gunton at build a little biz. It helped me get focused on what I was doing and what I needed. No matter how amazing your designer you still need to be really clear about what your biz is about and what you want. Karen says your brand “is not a tattoo” and I couldn’t agree more! On to you. Have you had any challenges with branding your small business? Have you ever taken a different direction and changed things up? Would love to hear from you in the comments! Hi Martina, I love the new look, not dissimilar to your old branding so still recognisable as you! It’s clean, fresh and explains what you can find on the site. Nice! Amen Martina! The evolution is beautiful, don’t you think? Smart post! Martina: Thanks for pointing out that branding is an evolving process and not a tattoo that will be the same all the time. Do you have some examples of small business brands that have done the journey? One brand evolution that I found really inspiring and interesting to watch was Natalie Sisson’s. She transitioned from her WomanzWorld brand into her Suitcase Entrepreneur brand when she determined her true passion was supporting entrepreneurs wanting to live a location independent lifestyle. A pretty big change, but she rocked it!